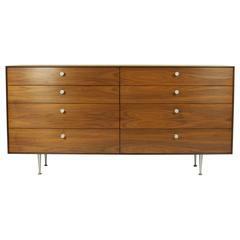 George Nelson rosewood "Thin Edge" eight drawer dresser for Herman Miller. Perfectly refinished and ready to enjoy, labeled. 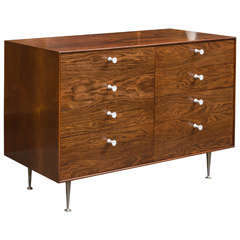 George Nelson design rosewood "Thin" edge dresser for Herman Miller. Perfectly refinished and ready to enjoy. Pair of original grain matched George Nelson design rosewood "Thin Edge" chests for Herman Miller. Very good original condition, labeled. George Nelson eight-drawer thin edge dresser. Walnut. Painted metal handles. Aluminum legs. Thin edge dressers by George Nelson for Herman Miller Porcelain handles and metal legs. Dressers have been refinished. A teak thin edge dresser with original porcelain pulls and metal legs. Designed by George Nelson for Herman Miller. 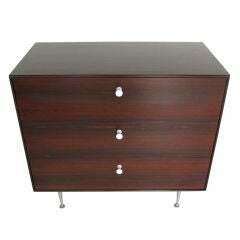 A classic George Nelson for Herman Miller, "Thin Edge" chest in rosewood. Three drawers, aluminum legs and original hardware.